Still orbiting Saturn after twelve years, Cassini continues to surprise and delight us with its discoveries. 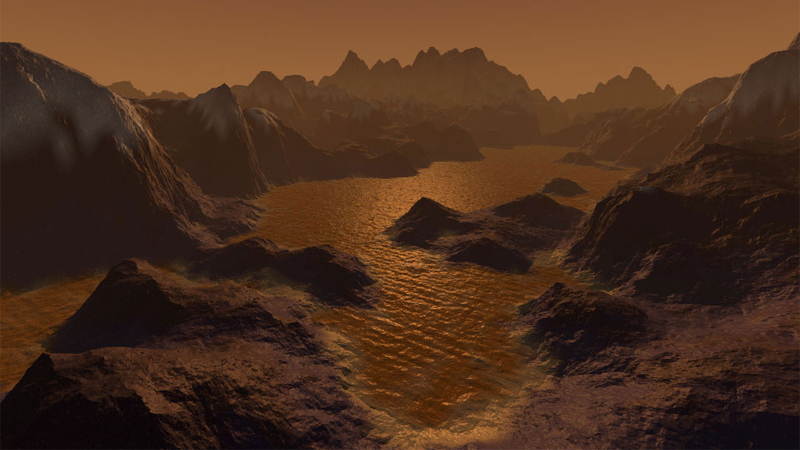 Findings by the NASA spacecraft suggest that Saturn's moon Titan contains deep, liquid-flooded canyons that may resemble fjords and alpine lakes on Earth. Titan is arguably one of the most interesting moons in the solar system, the only one with a thick atmosphere, in fact made of nitrogen and thicker than Earth’s! In May 2013, Cassini made a close flyby of Titan, focusing its attention on Vid Flumina, a Nile-like river valley, connected to the sea Ligeia Mare. Apparent drainage networks have been seen in many areas on Titan, mostly in connection with a lake or sea. However, Vid Flumina is a system of narrow, deep and steep-walled canyons. Some sections are 1,870 feet deep with walls sloped at 40 degrees -- even steeper than San Francisco's famous Lombard Street. Cassini's radar took the measurements, although normally it creates images of Titan's surface, pinging the moon with radio pulses and composing pictures based on the signal strength bouncing off the topography. Areas with varying amounts of slope and degrees of smoothness appear different in the radar data. The radar imaging technique has given us wonderful birds-eye views of Titan's landscape hidden from Cassini's visible-light cameras under a thick shroud of hydrocarbon haze. For years we have enjoyed scenes of high and rugged mountainous terrain, vast plains of dunes, dendritic networks of river-like channel systems and the wide, flat, incredibly smooth surfaces of numerous lakes and seas of liquid hydrocarbons. However, during the May 2013 flyby, Cassini's radar worked as an altimeter, measuring the elevations of terrain in and around the Vid Flumina complex. This "echolocation" method not only revealed the steepness of the canyon walls and the depth of the channels, but in a number of spots it also revealed "flashes" or glints of sharply reflected radar as if the radio waves were reflecting from a very smooth, very flat and level surface — like a body of liquid. This detection is the first direct evidence of pooled liquid in any canyon or drainage channel system on this cold and dynamic moon. Still more, the measured altitude of the liquid surfaces in some of these canyons was at sea level, while in other canyons they were hundreds of feet higher. Might the sea-level liquid channels in the deep, steep-walled canyons resemble Norway's fjords, and the higher-altitude pockets the pooling of alpine lakes in deep river canyons on Earth? What a sight they must be! The only direct images we have from Titan's surface came from the short-lived Huygens probe in 2005, and tantalizing as that glimpse was, the terrain at the probe's landing site was flat and dry. I will not say boring, it was anything but! The depth of these likely liquid-carved canyons tells us that they were either carved by erosion over a long period of time, or were cut quickly by processes we don't yet fully understand. Scientists are considering several possible means for their formation, including uplifted land or a changing sea level — or possibly both. Titan is one of the only bodies in the solar system, moon or planet, with an active liquid cycle on its surface. It's a version of Earth's water cycle, but at freezing temperatures where water is like solid rock, and hydrocarbons like methane and ethane play the role of liquid. And more and more, it appears that Titan's topographical features in many cases bear a strong resemblance to terrains found on Earth. Cassini may give us only a few more glimpses of Titan, as well as Saturn and some of its other fascinating moons, before the mission is terminated next year when Cassini will be driven deliberately into Saturn's atmosphere in an incinerating blaze of glory. NASA doesn't want to leave a piece of derelict space junk with decaying plutonium power cells flying around the Saturn system, which for all we know may be home to some form of life — especially those moons, like Enceladus, where we have detected the presence of liquid water.